Writing is a solitary occupation, which suits me just fine. I am at my happiest when we’re rocking gently at anchor and I’m tucked in on the starboard settee, my computer open on the table in front of me, a cup of coffee within easy reach, the oil lamp swinging gently overhead. Working in my treehouse when we’re at Meadowlark is almost as good—in some ways it’s better: my coffee never slides across the table when I’m not paying attention. And when I’m stuck, I can gaze out the window at cows grazing in the meadow below the treehouse. So getting myself ready for the launch of Sea Over Bow is a bit of a stretch. 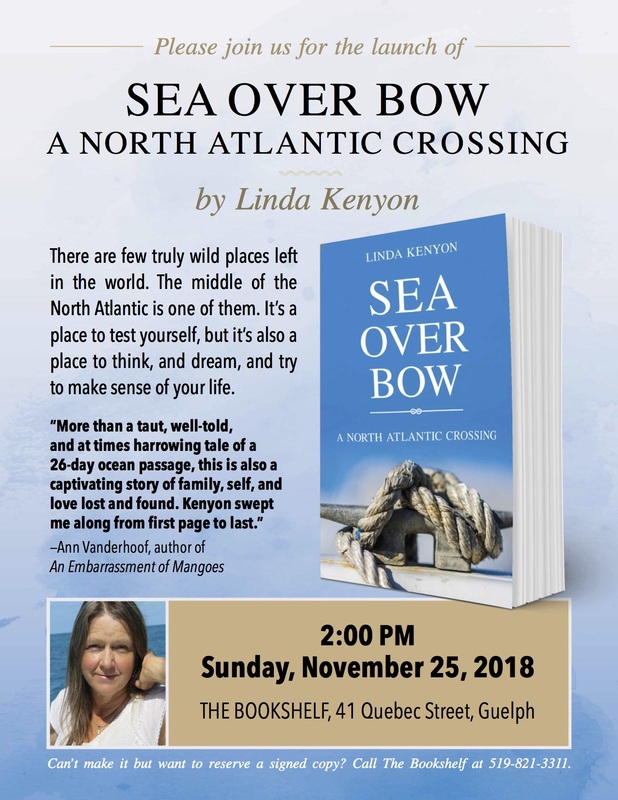 It all starts on Sunday, November 25th at 2pm with a reading and book signing at The Bookshelf in Guelph. I’ve already sorted out what I’ll read, and what I’ll wear. I’ve even bought new boots for the occasion: I call them my writer’s boots and will wear them to give myself courage. I’m feeling better about the launch now that books have finally arrived. Delays in printing have been frustrating, but they’re in stores now. The e-version of the book is out, too. Amazon, Chapters, and my publisher, Signature Editions, all offer it online. But what’s really making me feel confident are the initial reviews which have begun to appear. Below is my first online review at Chapters. Yes, it makes me blush, but it feels so good to be read—and praised. Who wouldn’t like that? Okay. I promise not to do that. I’ll give you a bit of background on the book, read for you, answer questions, sign books, and we’ll have a great afternoon together. And you can admire my new writer’s boots. Prepare to be swept along with Sea Over Bow! Well done on such a great review and blog. Can’t wait to see your new shoes next Sunday. Happily! It will be great to see you. I just picked up a copy in the “UWaterloo Authors” section at the campus bookstore – now I have to go back to work but I just want to keep reading!! I give you permission to read at your desk. Oh, so wish we could be there for your big day. We’ll be thinking of you. And admiring them boots.